The best graphics card will always hog the spotlight when you're putting together a new PC, but ignore the best CPU for PC gaming at your own peril. Not only can an outdated CPU create massive bottlenecks and end up undoing a lot of your work around other upgrades, processors don't get nearly the credit they deserve for gaming applications. Especially if you're a fan of intense simulations, be they space sims or the latest 4x empire builders, CPUs are critical for handling functions like AI, or modeling complex systems like weather or the behavior of star systems. One of our top selections for the best CPU for gaming, the 2700 is currently seeing a deep discount an Amazon, a full 26% off list price. Of course, finding the best CPU for PC gaming will also pay massive dividends for all your productivity tasks. Everything from handling multiple tabs in your browser to really processor intensive tasks like video or audio editing or rendering falls under your CPUs auspices, so an upgrade will improve not just your in-game experience but the whole quality of life of your PC ecosystem. For gaming, you can probably get away with a fairly modest chip from, for instance, Intel's Core i5 or AMD's Ryzen 5 family, but if you're serious about building a powerful workstation, you'll likely require something more cutting edge, an AMD Threadripper or one of Intel's 9th Gen Core i9 beasts. Regardless of where your machine falls on the CPU spectrum, you will need a great GPU to run the latest, hottest triple-A titles, so check out our best graphics card roundup. And to grab the best peripherals to complement your rig, take a look at our guides to the best gaming keyboard and best gaming mouse. If you find some of the technical jargon around all this PC tech a little hard to parse, head over to our hardware glossary to simply some of the most complex terms. 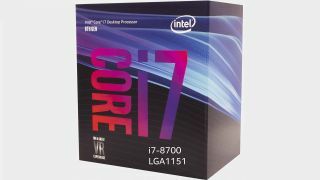 Teetering perfectly on the balance line between price and performance sits Intel's 8th generation Coffee Lake Core i7-8700. It's a very powerful, modern processor that will happily manhandle any gaming-related tasks your software throws at it, but it won't require you to take out a second mortgage to afford. Currently hovering right around the $300 price point, the 8700 is a great value proposition, and will keep your rig ahead of any CPU bottleneck for some time to come. Packing six hyper-threaded cores and Intel's performance enhancing, leakage reducing 14nm++ process, the 8th gen Coffee Lake flagship still offers plenty of power to navigate gaming's most challenging tasks and handle any of your workload/'mega-tasking' needs. The Ryzen 7 is an impressive line, eclipsing the dark days around the beginning of this decade when AMD was stuck as a second place CPU manufacturer with its misguided line of industrial-vehicle-named processors (Bulldozer, Steamroller, etc.). Starting with the first Ryzens and their all new x86 Zen core architecture, AMD has been providing power and performance to rival Intel’s best efforts at a fraction of the price. The 2700X is the highlight of the latest iteration of Ryzen processors, providing a significant increase in power despite launching at a lower price point than its well regarded predecessor, the 1800X. Mighty cache and memory performance are supported by an improved ability to reach 4.0GHZ even when all eight cores are engaged, and a streamlined, better designed processing management engine. The 2700X is a tremendous centerpiece of both a top-notch machine built for demanding work applications as well as an excellent choice for gaming. The problem with high end CPUs is that all that additional processing power comes with a correspondingly high price tag, and for a lot of gamers, that additional horsepower is largely wasted, particularly if you aren’t taxing your machine with a heavy workload outside of gaming. While a CPU is important for gaming, if you’re satisfied playing on slightly lower settings, the Ryzen 3 2200G is an incredible value that still provides a solid amount of power. Another big advantage of the 2200G for gamers on a shoestring budget is that it includes modest integrated graphics capability that can tide you over until you can afford a proper GPU. If you’re trying to build a budget PC that will get you in the gaming door but leave you plenty of cash to actually purchase some of those games you’re craving, the 2200G is an excellent starting point. If Intel's 8700X is a superhero bristling with raw power, the 9980XE is Thanos. Its insane 18 cores and 36 threads provide a ludicrous level of performance that is, frankly, massive overkill except for the truly obsessed (and very rich). It's a CPU custom made for early adopters who demand the most cutting edge performance on the market. For those with the budget to afford it, however, the 9980XE is an incredible work of technological art, the fastest desktop processor on the market, and getting in now ensures that you won’t need an upgrade for many years to come. It’s tough to imagine even the next generation of games beginning to challenge the 9980’s capabilities until very late in the cycle, if ever, meaning for gamers it’s the last CPU you’ll need to buy for a very, very long time. On the other hand, if you’re in the market for some truly explosive power but aren’t obsessed with having the absolute zenith of CPU tech, AMD’s blistering Threadripper 1950X is a great solution at almost half the price of the 7980XE. While it’s built for desktop applications first, being an adaptation of AMD’s Epyc server CPU, it’s no slouch for gaming and remains amongst the highest performing CPUs on the market. The Threadripper is perfect for the sort of gamer who loves to multitask, pushing a processor by demanding top performance in games while balancing a heavy workload of other programs, be they streaming or browsing or rendering or all of the above. If you’re a gamer who also leans heavily on your PC for work functions, and don’t want to push all the way up to the 7980XE, the Threadripper will fit your needs like a perfectly tailored suit.